We’re ankle deep in the usual anxiety driven morning rush. I’m simply trying to walk to my car and Jager keeps stopping short in front of me to lick his front leg. And it’s after berating the spotted dog that my neurons refocus from the lamentations of why can’t I just get up earlier over to … hey, what’s up with your leg, Jager? And that’s when my brain clicks over to ruh roh mode. Is that … wait a minute. Is that blood? Alrighty then. Priorities, people. I abandon my office-on-wheels bag to rest in the driveway and usher Jager back into the house. He’s got the adrenaline shakes and there’s fresh blood on both his front legs. Jager is so tense, it’s difficult to do anything but a cursory exam. But I don’t see any wounds or even where the blood might have come from. Criminy, what did this dog get into this time? It’s times like this* that we’re reminded of the enigma of Jager’s breed heritage. We really can’t prove he’s one thing or another. Whether it’s terrier DNA in this dog’s genetics or Shetland sheepdog, Rottweiler or badger, we do claim a level of confidence that the predominate breed is All American Critter Hunter. Along with a squeaky toy and an adoption certificate, The Jagermeister came to us with his rather apt name. We didn’t give him this German moniker of “Hunt Master,” but it does fit him well. It is his purpose on dog’s green Earth, he says, to keep our backyard free of all things feral and furry. The ubiquitous gray squirrel population has been his primary nemesis. They smack talk each other from their respective places with the typical taunts you’d expect to hear from such equal foes. I tell Jager they don’t even know his mother, but there’s no calming him down once the tree rats hit that note. Still, I don’t see any clues that link this morning’s incident to squirrel related activity. After Jager calms down and I get most of the blood cleaned off, I’m still puzzled by the source of it. I know I’ll feel better having the vet look him over anyway, so against the vigorous protestations of the spotted dog we make a morning appointment. So there’s this look Jager has when he wears the mantle of the Professional Victim. He drops his ears, darkens his eyes into liquid pools and goes about convincing people his most basic needs are completely and consistently neglected. The dog can work it. And work it well, he does. 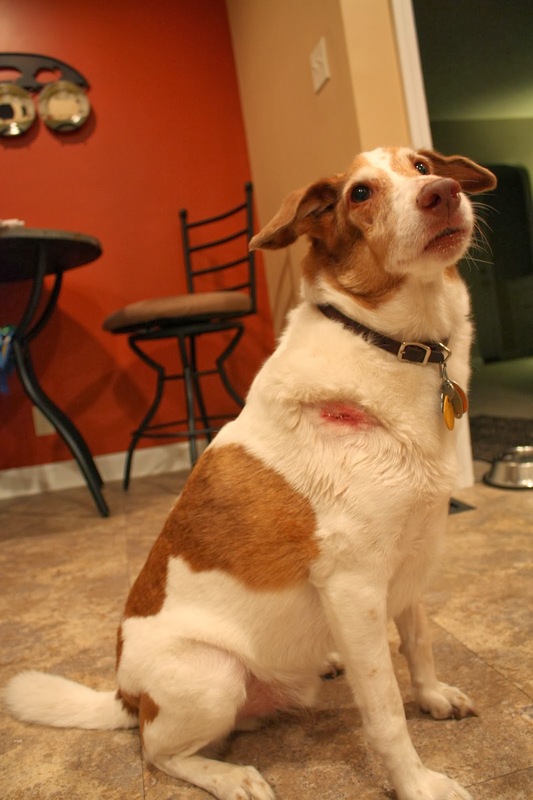 From the vet’s waiting area to the exam room, he is telling everyone about his battle wounds and please don’t stick him with those pointy things because he’s already suffering and that would [sniffle] just make it all worse and won’t someone just give him a cookie or something already. Meanwhile, I’m rolling my eyes as everyone is all oh poor Jager, you’re so sweet Jager, and such. Until the vet comes in and I try to explain, without sounding like we live like hillbillies, that I think he might just have tangled with an opossum in the yard since we have the good fortune of hosting a colony living near the wood pile. The veterinarian then – this is the dog honest truth now – holds Jager’s head in her hands and looks him in the eye to tell him how dangerous opossums are, what with all those sharp teeth and tiny brains. With this suggestion of derring-do, served with a side dish of bad-assery, the spotted dog perks up. Actually, the vet tells me it appears the Master of the Hunt likely bit his tongue, perhaps when slipping on an unexpected icy patch in the driveway, and anyway that’s where the blood came from. A full medical exam revealed no puncture wounds, except for a cut on his tongue that is no longer bleeding. So what’s a girl to believe? *So this photo shares an earlier episode of Jager bad-assery. He tried to run through the fence while chasing the neighbor’s cat from our yard. The result was four staples in the shoulder. With no local anesthesia.